I changed My writing sample to fit the feel of a character post. Post on day of the week. I take a Rest on weekends, so probably don't wait for me to respond. More applications added to the list. A little over 48hrs till the deadline. I know I have not gotten feedback to some applications and I will get to them. I have been trapped late at work the last several days and have not had the time to devote to thorough reviews. I want to give each of your applications the full attention it deserves. So do not worry if you have not heard from me; you will soon. Not gonna make it tonight I think. Nevermind! Good luck to everyone! Appearance: Shana has traveled far from her homeland of Al'Qadim, and the travel shows. At first glance, Shana looks like a pile of old coats on a rack. Layers upon layers of thick, dusty cloth form a soft exoskeleton around the woman beneath. The knits and embroidered patterns come from different cultured all across the world (and maybe even a few other worlds). Layers of bandannas and wraps cover her nose, mouth and hair- so only her stern, dark eyes can be seen- and yet her bone-dry voice carries beyond those wraps unhindered. She carries a rusted iron censure that leads many of the common folk to assume that Shana is some sort of priestess for a god they've never heard of. In a way, they're right. The layers of her outfit hold years upon years of smells - of musty tombs, ancient tomes, and so many sticks of incense. One would think that these compounded odors would be insulting to the senses, but the scent of antiquity is a quiet and gentle one. Beneath the outer layer, Shana is a slim but sturdily built woman in her mid-forties to early-fifties. Her hair is ebon-black, her skin tawny, her features fair. Her hands and feet are wrapped in linen wraps like a mummy- with only her black-painted fingers and toes exposed. Trait 1 I am utterly serene, even in the face of disaster. Trait 2 I feel tremendous empathy for all who suffer. Bond I entered seclusion to hide from the ones who might still be hunting me. I must someday confront them. Flaw Unlocking an ancient mystery is worth the price of a civilization. Writing Sample: Write about your character’s backstory or what brings them to Kamplinn? Do you live here or were born here? Passing through on the road or river as a merchant, private guard, etc. It does not have to be terribly long. Just give me a solid idea who they are. You are level 1 after all. Last edited by Inuvash255; 09-21-2018 at 06:55 PM. @silverfeathers, my application is complete I believe. Okay, applications are now closed. Thank you to everyone that submitted an application. I will be reviewing applications again this weekend. I plan to send out PMs on Monday (Tuesday at the latest) to those selected; and get the game up by the weekend. Best of luck everyone! Hopefully I'm in, and if so I look forward to infest you all with Zuggtmoy's mind-controlling spores gaming with you! Me too! Today Is the day I hope! We will here how got in!! Good luck everyone! Looking forward to hopefully adventuring with y'all. Thank you so much to everyone for showing interest in this campaign and to those that took the time to create an applications. I was not expecting such a good turn out for my first attempt and DMing, so I feel very blessed to have all of your support. There were so many solid and strong applications that I had a hard time making the choice of whom to bring into this game. In the end I made my selections and have sent out invitations to all. Almost all of them have been accepted. If you did not receive an invite to the game, know that I had a hard time choosing and felt terrible having to not take more players. Be on the look out for another campaign from in the future or possibly finding replacements for this one. Again, thank you all for your enthusiasm and turn out for this game. Recruitment is open again. I am looking for 1 to 2 players. Please see the original game advertisement on the first page for details and updated information. If you have previously applied for this game you are welcome to apply again with a new or old application. Just a quick question, you may have mentioned it and I went by it by accident, are you still looking for Level 1 ? Or has your group moved past that already? We are still at level 1, they have not gotten far due to the holidays. 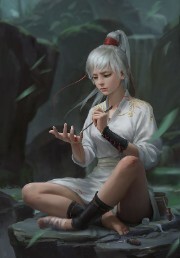 Appearance: Wispy white hair that easily catches the wind; hazel, almost honey colored eyes; sun-kissed skin that bronzes easily in the summer season; slightly taller then average height and a bit malnourished weight from years of fasting off and on within her monastery. 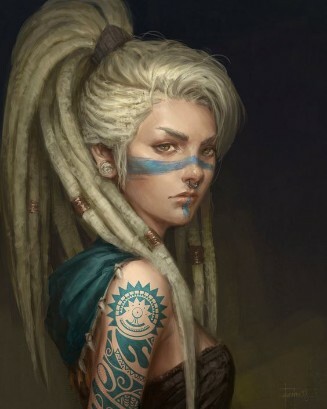 In adventuring, Bleu adorns her body and face with light blue warpaint in various patterns and symbols reflecting her tribal heritage. Recently, she's discovered the love of body art and piercings and occasionally will wear one on her nose or eyebrow. Personality: Bleu is the last of her kind, her monastery destroyed by mystical forces unbeknownst to her and now embraces a pilgrimage far from her mountain homelands into society. Her passion of learning and understanding drives her quest for greater knowledge about what or who had leveled her community and her life. Bleu, upon wandering through various cities and towns, scoured libraries and wise-men seeking any useful information she could acquire. She keeps well-recorded notes in her journal of such information and spends a lot of her free time inscribing and recording. Often times, Bleu mediates in deep reflection in attempt for clearer perspective and understanding of the world around her, at times she can seem preoccupied, aloof or even uninterested during these meditative moments. Though kindness and compassion are her ruling factor when it comes to approaching any new situation, her social awkwardness tends to often obscure those gentle qualities and some people find her a bit primitive in her basic social interactions. “Let’s have a drink and I’ll tell you more,” he says sounding less desperate, guiding you to the only pub in Kamplinn. It wasn't enough that she had just stepped in some kind of fresh animal dung upon her arrival into Kamplinn; no, no... now she had complete strangers grabbing at her sleeve and daring to manhandle her. Instinctively, all the red flags instantly hoisted themselves at full mast within her mind. "You... You sir... Do not.. " she barely formed any complete sentence in her disgust and alarm... "Sto....hey... Come on now... STOP". Bleu shook off his grasp of her shoulders and wedged her foot into the dirt. " Now then!" Clearing her throat and straightening her disheveled clothing while keeping a keen eye on the man, Bleu takes a step towards him with her finger pointed at his nose. " That's no way to ask for help. I see you're distraught and I can tell you right now, that drinking isn't going to solve any of your problems." She scolded him and threw a look of questionable doubt of his motives before sighing deeply. "I will join you to hear your grievance Sir, but I advise you to not touch me again." In truth, Bleu had been preoccupied in her own thoughts to have actually noticed the man's pleas to others before approaching her, he had truly startled her. Though, now, as the adrenaline started to fade and she composed herself back into rational thinking, she felt the man was true in his request for aid and was merely acting in desperation rather then malice. As she walked with him towards the... pub, a term she'd recently only understood as tavern or watering hole, Bleu listened to his story....Before they reached the threshold of the building, she removed her white sandals and put them just on the outside of the doorway. "Ok...I can help, but I don't think I can do this alone...."
Last edited by MeredithS; 02-13-2019 at 02:47 PM.